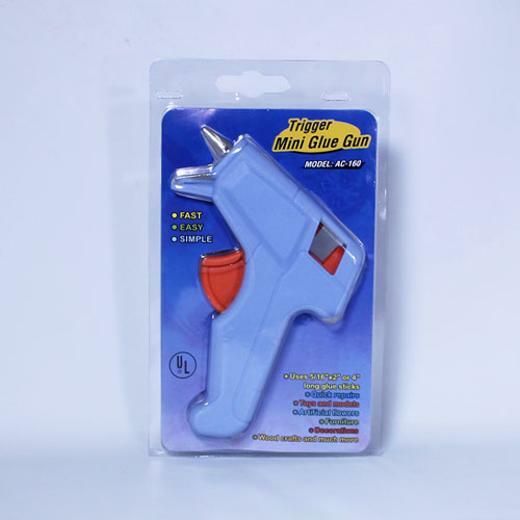 1 Light blue mini glue gun. Make crafts and quick repairs simple and easy with our high quality mini glue guns available in a variety of fun colors. Great for hobby, arts and crafts, and everyday use. Low temp, dripless glue guns makes crafting fun and limits the amount of mess. At a mere 6" this adorable glue gun is super portable, plugs in and begins heating up instantly. Perfect for crafters on the go and use by kids with parental supervision. L: 8.0 in. W: 5.0 in. H: 1.5 in.